After buying the game in uh january, I finally started playing command&conquer 3 a week ago. I postphoned playing it for various reasons, the main reason being that I didn't think that I'd like it, and I can't be bothered doing effort during the schoolyear. Lol that sounds bad, like playing a game is so horrible that I have to do effort for it. Anyway since it's vacation now, I didn't have an excuse anymore and started playing the campagin. It was way nicer than I expected. The videos between the missions had real actors, it made me feel like I was in a movie. The missions were fun, and because the game is so fast paced, I didn't even get a chance to get bored. I finished most of the GDI campaign now, and did part of the Nod one. This is probably the most that I've ever played a campaign, so congrats c&c, you made me like a campaign. 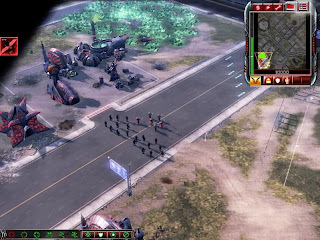 Most of the missions in the campaign consist of the same routine: collecting tiberium and building a base with the funds that it gives you, all while the enemy attacks you. 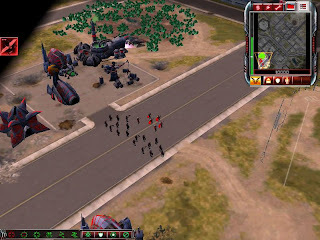 Then you build up your army and take out the enemy base. In the other missions, you just get a few units that you have to complete objectives with. Tiberium is a powerful mineral that spreads rapidly across the globe and is toxic to carbon based lifeforms. Despite it's negative effect on human life, tiberium is a very useful energy source. The main objective of the GDI is to stop the spread of the toxic tiberium and destroy the terrorists of the Brotherhood of Nod. The brotherhood is a religious organisation that believes in the potential of tiberium as the catalyst of the next stage of human evolution and tries to accelerate its spread. The leader of the brotherhood is Kane, a charismatic man whose authority within the brotherhood is unquestioned. Earth is divided in 3 areas: a red zone where tiberium has spread so much that human life is impossible, a yellow zone that's heavily contaminated with tiberium and a blue zone that's protected by the GDI and is still free from tiberium exposure. Most of the world's population lives in the yellow zones, and this is also where the brotherhood of Nod has its bases. When the brotherhood launches an attack on the GDI, the third tiberium war begins. A significant difference, right? Look how much nicer the tiberium looks, all glowy and stuff. And the units have shadows. I like shadows.